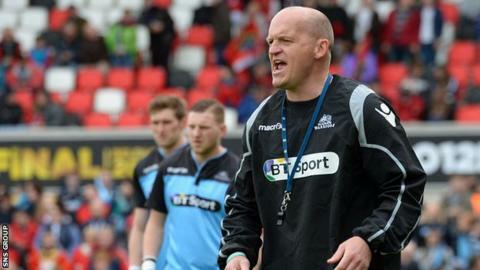 Head coach Gregor Townsend has signed a contract extension to remain at Glasgow Warriors until June 2017. Glasgow reached the Pro12 semi-finals in Townsend's first campaign and were runners-up the following term, going on to lift the trophy in May with a 31-13 victory over Munster in the final in Belfast. "I firmly believe that there is a lot more to come from this group of players - their work ethic and desire to improve has me very optimistic about the future," he added. Capped 82 times for Scotland, Townsend's club career included spells in Australia, South Africa and France, and he also featured for Northampton Saints and Border Reivers. Prior to his Warriors appointment, he coached with Scotland from 2009, working under Frank Hadden and Andy Robinson. "He has created a consistent winning culture at Scotsoun and that is benefitting both the club and the players he works with," said Scottish Rugby chief executive Mark Dodson. "After Glasgow Warriors became the first Scottish team in the professional era to win a major trophy it was only natural Gregor's talents would be of interest to other clubs. "We maintain a constant dialogue with our coaches and believe he remains the right person to take the Warriors forward and consolidate their recent success." Townsend, whose contract was set to expire next summer, has been instrumental in developing young Scottish talent like Stuart Hogg, Mark Bennett, Alex Dunbar, Finn Russell, Adam Ashe and new club skipper Jonny Gray. Warriors provided a record 21 players competing at this year's World Cup in England, 17 of which were in the Scotland squad.